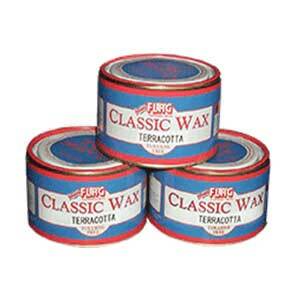 Lustra Table Top Wax 15 oz. ; Lustra Table Top Wax, unlike wood and antique care polishes like Briwax, is a high solids wax polish specially formulated to be used interior or exterior where resistance to water is important, such as walls, wainscoting, kitchen cabinetry, kitchen and patio table tops. Lustra Table Top Wax is particularly effective on country antiques and reproductions used in and around the kitchen and where wiping with a damp cloth is necessary, producing a low luster shine that enhances the aesthetic qualities of the substrate to which it is applied. 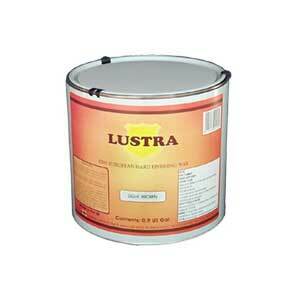 Lustra Table Top Wax 15 oz. Lustra Table Top Wax, unlike wood and antique care polishes like Briwax, is a high solids wax polish specially formulated to be used interior or exterior where resistance to water is important, such as walls, wainscoting, kitchen cabinetry, kitchen and patio table tops. Lustra Table Top Wax is particularly effective on country antiques and reproductions used in and around the kitchen and where wiping with a damp cloth is necessary, producing a low luster shine that enhances the aesthetic qualities of the substrate to which it is applied. Lustra Table Top Wax is ideal as a seasonal pick me up to patio furniture pieces, including patio table tops of slate, terracotta and various stone types. Lustra Table Top Wax works well in providing a lustrous shine to weathered or sun bleached interior and exterior surfaces, new and old, and table tops of all types. As a high performance sealing wax to resist random water spills and condensation, Lustra Table Top Wax is excellent for preventive maintenance on table tops and surfaces of furniture and cabinetry. 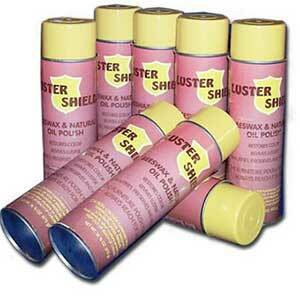 Lustra Table Top Wax can be used easily on a regular as needed basis. It is easy to use and easy to be around. 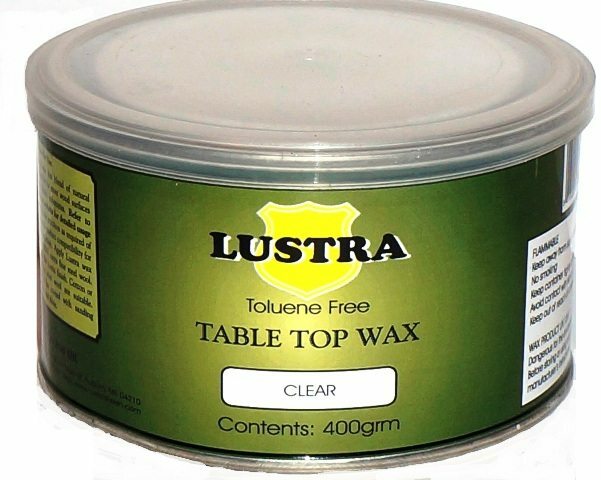 Lustra Table Top Wax is toluene free. Unlike toluene based waxes that are known for their noxious odor and too fast drying times, Lustra Table Top wax is far superior on both counts in this regard. 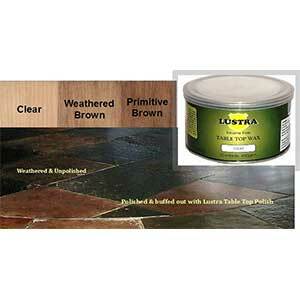 Lustra Table Top Wax is the perfect polish to shine table tops of all types where resistance to water spills is needed. When a wax polish is suitable or has been used, and when resistance to water is desired, Lustra Table Top Wax is the polish that makes sense to use. Lustra Table Top Wax can be used on coffee and kitchen table tops, kitchen cabinetry or to bring life and shine back to the walls, woodwork, furniture and cabinetry in the home, for the porch and backyard. Although this product does not contain toluene we do recommend the use of a respirator when applying Lustra Table Top Wax.